" Such a beautiful peaceful place. The lodge is beatiful & the the views aweinspiering. This should really be featured on a travel show!" Sahin & Zeenet, Fiji/USA. Experience a 1.5hr river ride down an enchanting and mystical jungle valley. Sections of the river are fast and fun, others are mellow and relaxing. 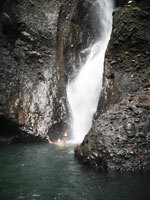 Then we head to a mistical volcanic hotpool in the midth of lush tropical forest to warm up and complete a perfect trip in the water. This is an awesome fun filled adventure for all. Not to be missed! Suitable for children from 6 years and upwards. $95 includes lunch & snacks.